On the plaque nailed to the top of the cross, in Hebrew, Greek, and Latin: "Jesus Christ King of the Jews"
Saint Catherine of Siena, a Christian mystic and lay member of the Dominican Order, appears in half-length in the lower right corner, gazing upward at the Crucifixion taking place high in the mountains. She holds a lily and a miniature crucifix identical to the one above. Hands folded in prayer, the wounds of her stigmata are visible on her palms. The viewer's eyes follow Saint Catherine's gaze, turned to the Virgin who looks up at Christ. Saint John the Evangelist, in a bright red and green garment, looks out sorrowfully and gestures towards the observer. Like the visionary Saint Catherine, the viewer is invited to contemplate the universal significance of Christ's suffering. Behind the figures, an extensive Italian landscape, elaborated with a winding river and a town, stretches into the background. To contrast with the somewhat static quality of the figures, Marco Pino has painted a tempestuous sky, dark blue near the top and gradually lightening into pink and yellow at the horizon, representing the darkness that came over the land for three hours when Jesus died. Alfred S. Karlsen (Beverly Hills, California) [unsold, Karlsen sale, Christie's, London, November 19, 1971, lot 80], donated to the J. Paul Getty Museum, 1973. Zeri, Federico. Pittura e controriforma: L'arte senza tempo' di Scipione da Gaeta (Turin: Giulio Einaudi, 1957), pp. 32, 39-40, fig. 23. Borea, Evelina. "Grazia e furia in Marco Pino." Paragone 13, no. 151 (July 1962), p. 38. Christie, Manson & Woods, London. Fine Pictures by Old Masters. November 19, 1971, p. 25, lot 80, pl. V.
Fredericksen, Burton B. "Recent Gifts of Paintings." The J. Paul Getty Museum Journal 3 (1976), pp. 103-4, fig. 1. Calí, Maria. Da Michelangelo all'Escorial: Momenti del dibattito religioso nell'arte del Cinquecento (Turin: Giulio Einaudi, 1980), p. 193. Bartalini, Roberto. "Marco Pino." In Da Sodoma a Marco Pino: Pittori a Siena nella prima metà del Cinquecento. Fiorella Sricchia Santoro, ed. (Siena: Palazzo Chigi Saracini, 1988), pp. 193-94, fig. 117. Leone de Castris, Pierluigi. 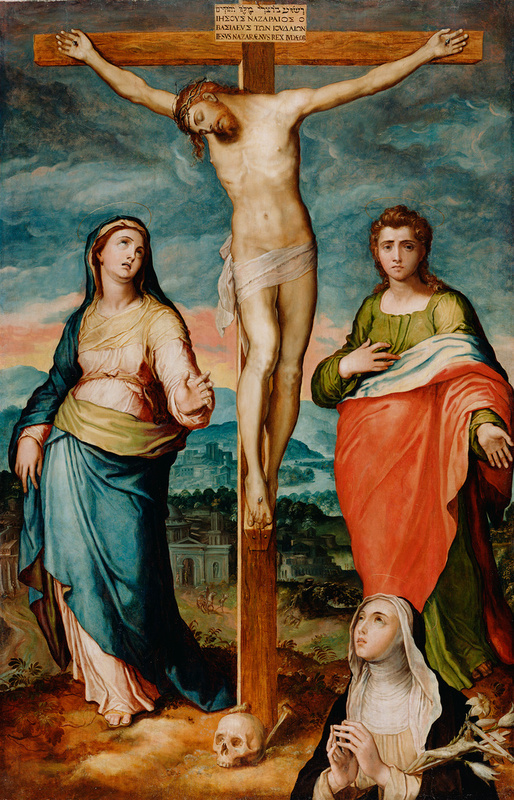 Pittura del Cinquecento a Napoli: 1540-1573 Fasto e devozione (Naples: Electa Napoli, 1996), p. 229n26. Jaffé, David. Summary Catalogue of European Paintings in the J. Paul Getty Museum (Los Angeles: J. Paul Getty Museum, 1997), p. 96, ill.
Pavone, Mario Alberto. "Dal Rinascimento meridionale al tardomanierismo: protagonisti e comprimari." In I dipinti dal Quattrocento al Settecento. Mario Alberto Pavone and Matilde Romito, eds. (Salerno: Pinacoteca Provinciale di Salerno, 2001), p. 51. Zezza, Andrea. Marco Pino: L'opera completa (Naples: Electa Napoli, 2003), pp. 10, 172, 174, 263, no. A.17, fig. IV.11; p. 333, under no. E.45.